Nova Scotia Duck Tolling Retrievers: the most honest dog breed review you'll ever find about Nova Scotia Duck Tolling Retriever temperament, personality, and behavior. To the casual eye, the Nova Scotia Duck Tolling Retriever looks somewhat like a Golden Retriever, but with a more copper-colored coat and white markings. 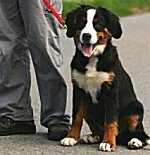 But in temperament, these breeds are very different. Compared to Golden Retrievers, most Tollers are less submissive, less outgoing with strangers, and less adaptable to a low-exercise household. This high-energy breed is a joy in the right hands – but "too much dog" for someone who is looking for an eager-to-please couch potato. High-spirited and playful, quick moving and agile, the Nova Scotia Duck Tolling Retriever needs plenty of exercise, especially fetching and swimming. 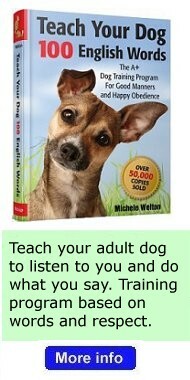 Mental exercise (advanced obedience, agility, tracking, field work) is just as important. This breed is not a good choice for a casual pet. Reaction to strangers varies from reserved to curious, but often includes some initial caution. He needs early and ongoing socialization to avoid suspiciousness or timidity. The Toller is usually fine with other family pets. He may chase your cat, but seldom means any harm. Though bright and clever, most Nova Scotia Duck Tolling Retrievers are easily distracted and easily bored, which can make training more difficult. Other Tollers are surprisingly strong-willed, testing your rules to see what they can get away with. You must demonstrate consistent leadership and keep training sessions short, upbeat, and challenging. As with all retrievers, the Toller can be "mouthy" – you must control his tendency to chew on objects and to mouth your hands. Provide a box filled with toys so he can carry something around in his mouth. 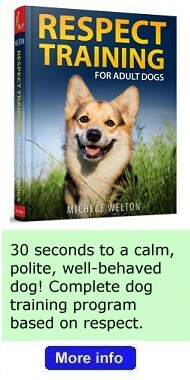 When excited or anxious, Tollers tend to whine and "whistle", which can be irritating when done to excess. A Nova Scotia Duck Tolling Retriever may be right for you. A Nova Scotia Duck Tolling Retriever may not be right for you. You can avoid some negative traits by choosing an ADULT dog from an animal shelter or rescue group. With an adult dog, you can easily see what you're getting, and plenty of adult Nova Scotia Duck Tolling Retrievers have already proven themselves not to have negative characteristics. 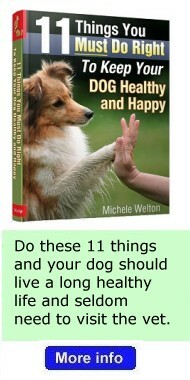 Finally, you can avoid some negative traits by training your Nova Scotia Duck Tolling Retriever to respect you and by following the 11-step care program in my book, 11 Things You Must Do Right To Keep Your Dog Healthy and Happy. Providing enough exercise and mental stimulation. Duck Tollers were bred to be working dogs – not simply pets to hang around the house or backyard. Too many people acquire this breed because of its athletic prowess and handsome appearance; then they don't provide enough opportunities for the dog to vent his energy and do interesting things. Bored Tollers express their frustration by barking and destructive chewing. If you want an easy-to-live-with pet who doesn't need much exercise and sleeps most of the day, this is not the breed for you. 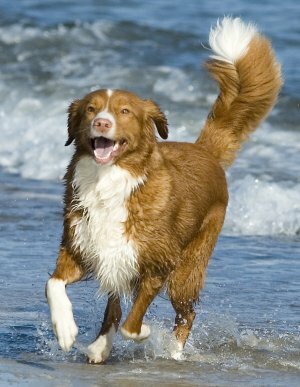 Most Tollers want to run and hike and swim and play fetch games and participate in field work (hunting), or agility (obstacle course), or advanced obedience, or tracking, or a similar canine activity. Mind of their own. 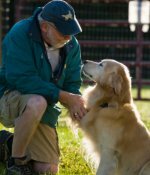 Unlike most Golden Retrievers, most Tollers have an independent mind of their own and can be manipulative or willful. You must show them, through absolute consistency, that you mean what you say. To teach your Toller to listen to you, "Respect Training" is mandatory. 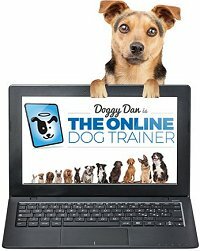 Read more about Toller Training. Providing enough socialization. Compared again to Golden Retrievers, most Nova Scotia Duck Tolling Retrievers do not greet strangers with blind enthusiasm. Many Tollers, in fact, are standoffish and need extensive exposure to people and to unusual sights and sounds. Otherwise their natural caution can become shyness or suspiciousness. Grooming and shedding. To keep their pretty feathered coat free of mats, Tollers require regular brushing and combing, and occasional trimming. And they shed quite a bit, so be prepared for vacuuming!